Ghost of the Polish Airman: During WWII, a bomber plane crashed into a bog near a British airbase in Lincolnshire, England, killing the 5 Polish crewmembers aboard. For 40 years afterward, people walking near the bog often met a man dressed in a WWII flier's uniform who spoke to them in a foreign language. On those days, the distinctive tail of a bomber was often seen disappearing into the bog. In the 1980’s, workers in the bog found the wreckage of the plane, and buried remains of the crew. No ghostly planes or pilots were seen there again. Ghost of George Washington: During the US Civil War, Union soldiers were battling confederate troops at Gettysburg, Pennsylvania, when a figure appeared before them. It was an officer on a white stallion with a flaming sword, dressed in the uniform of the American Revolution. It was the ghost of George Washington, who then called out the command, “Fix bayonets! Charge!” The Union soldiers charged down the hill and forced the Confederates into a full retreat. Current Gettysburg residents say that sometimes on hot summer nights they still see a ghostly rider on a beautiful white horse galloping across the battlefield. Lady Howard: One of England's most famous ghosts is the wicked Lady Howard, who in a phantom coach made from human bones - the bones of her four late husbands. The skeleton of a dog runs beside the coach. The story goes that each night the coach comes to Oakhampton Castle in Devonshire and the skeleton dog picks a blade of grass from Oakhampton Park to carry back to Lady Howard's family home. She has to take this journey every night until every blade of grass is picked - that is until the end of the world - as a punishment for murdering her four husbands. Anne Boleyn: When King Henry VIII wanted to marry another woman his wife, Anne Boleyn of treachery and had her beheaded. 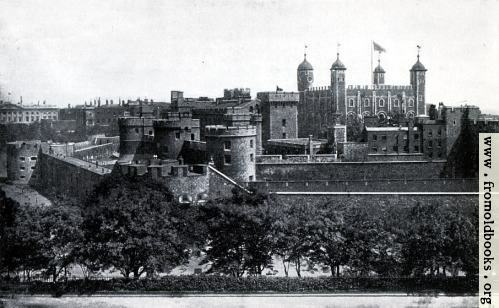 Anne's body is said to ha, he accused unt the Tower of London where she spent her final hours. She has been seen as a pale figure in a grey dress, who carries her head under her arm. The Flying Dutchman: In 16 41 the Flying Dutchman was sailing around the Cape of Good Hope on its way to Holland. Its captain was a man called Henrik Vanderdecken. A huge storm blew up but the captain was so desperate to get home that he cursed God and swore that he would sail until Doomsday rather than stop. For these words against God he was doomed to sail forever until he could find another ship's captain to accept a letter from him which begged for the Lord's forgiveness. This has never happened and it is said that any ship that comes into contact with the Flying Dutchman will suffer a terrible fate. LORELEI (pronounced lorer-lei) is a German ghost who appears as a beautiful woman. She sits on a tall rock on the banks of the river Rhine and sings a song so enchanting that sailors who hear it lose all sense of direction and steer their boats onto the rocks. The Brown Lady of Raynham Hall: The Brown Lady is famous mostly as being one of the most reliably photographed ghost in history. Although she has not been seen since 1936, she is said to wear a long brown dress or cape. No one knows who the Brown Lady is, or how she is connected to Raynham Hall. 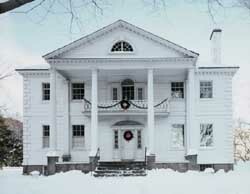 The first sighting was reported in 1835 by a house guest, Colonel Loftus. He actually viewed her twice. He said she was wearing a brown satin dress and had only black empty sockets for eyes. Another sighting was made by Captain Frederick Marryat. He intentionally slept in the "haunted room," but instead caught a glimpse of the Brown Lady an upstairs hallway. His description was the same as Loftus', except this time the Brown Lady was carrying a lantern. Marryat happened to have a gun with him, and fired point-blank at the figure. The bullets, of course, passed right through the ghost. The ghost was not reported again until 1926, at which time it was viewed by two little boys. In 1936, the famous photograph was taken by photographers Captain Provand and Indre Shira during a shoot for the magazine -Country Life-. Shira saw the ghost on the stairs, and instructed Provand to take a picture. The Bell Witch: "The Bell Witch" haunted the Bell home in Tennessee in the early 1800s. The "witch" was actually a poltergeist, which did lots of annoying things like throw things around and scream/knock loudly at all hours. John Bell, the father, died during the Bell Witch's tenure. Some claim he was poisoned by the Witch. Betsy Bell, John's daughter, is suspected of having faked the whole thing. Reliable records are lacking, so we'll probably never know whether the Bell Farm was truly haunted. Borley Rectory: Borley Rectory is often called "The most haunted house in England." The site of the rectory originally held a monastery, which was inhabited by Benedictine monks. Subsequent to this, the monastery came under the ownership of the Waldergrave family, who occupied it for three centuries. In the late 1800's a descendant of the Waldegraves, the reverend H.D.E. Bull, built a new rectory on the site of the old monastery. It was not until after the new rectory was built that strange things started to happen. One of the specters that was said to roam the grounds was a nun ho in the 13th century fell in love with and tried to elope with a monk. According to legend, the nun and monk were caught in their get-away horse and carriage. As punishment, the monk was hung and the nun was walled up alive in the rectory. 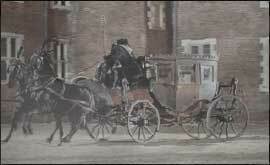 Some people reported seeing the ghostly form of the horse and carriage in addition to the nun. The reverend Harry Bull, who died at Borley, also was reputed to have haunted the rectory. He would appear dressed in the gray jacket in which he passed away. In the late 1920s, the house was owned by a reverend (Lionel A. Foyster) and his wife who reported poltergeist-like phenomena. Supposedly the prankish spirit locked the wife in the bedroom, and other times threw her out of the bed. There were also pebbles thrown at the windows, and mysterious writing which would appear on walls. Harry Price, a famous ghost hunter, investigated Borley Rectory in 1929, and again in 1937. He supposedly witnessed some of the activity, including the ghostly nun. Although Price spent a great deal of time in the Rectory, his research is generally considered to be biased and therefore flawed. Unfortunately, Borley Rectory burned down in 1939, taking its secrets with it. In 1945, human remains rumored to be those of the nun were found on the site, and were given a proper burial. But the legend of Borley has not died yet; people still visit the site today to see if they can spot the ghostly nun. Drury Lane Theatre: The ghost is described at various times as a soft green glow, or a handsome young man. During renovation in the late 1970's, they stumbled on a skeleton with the remnants of a gray riding coat with a knife sticking out of its ribs. The ghost is that of a young man who was murdered in 1780. J. Wentworth Day, a ghost hunter, reported seeing a moving blue light in the theatre in 1939. The Tower of London: The Tower of London has a long and bloody history, and of course many ghostly legends are associated with the Tower. In 1483, two young princes were murdered in the Tower, and their ghosts were reported to have haunted the tower until the year 1674, when their bones were found and buried in a proper ceremony. The most famous and most often reported ghost in the Tower is Anne Boleyn. She was beheaded by her husband, Henry VIII, in 1536. Other Tower ghosts include Sir Walter Raleigh, Guy Fawkes, and even the apparition of a bear. In 1816, a palace guard who was on duty spied the bear. Not realizing he was facing an apparition, the guard attempted to lunge at the creature with his bayonet. The guard reportedly later died of shock. In 1864, a soldier saw a ghost and again attempted to use his bayonet. The soldier fainted when he realized his antagonist was a ghost, and was later court-martialed for neglecting his duties (hard to guard the castle when you're fainted dead away). However, the charges against the soldier were dropped when two witnesses came forward to support the soldier's ghost story. Winchester Mansion: The Winchester Mansion, in San Jose, California, was built by Sara Winchester, the widow of William Winchester. Sara visited a psychic who told her that she must build a house large enough to house the souls of all those who'd been killed by Winchester guns, and Sara spent the remaining 36 years of her life (until she died in 1922) doing just that. The mansion's construction is just as odd as Sara's personality. There are stairways and doors that go nowhere, secret rooms and passages, and elevators that only go up one floor. Some believe that Sara had the house built in a confusing way so that the sprits wouldn't be able to find her and seek revenge. The number 13 is prevalent throughout: 13 bathrooms, stairways with 13 steps, and so on. There is a rumor that Sara would never give her workmen the day off, because she was afraid that the day she stopped building she would die. One day, however, after many complaints, she finally gave her staff a day off, and that is the day she died. The Chase Vault (AKA The Moving coffins of Barbados): In Christ Church cemetery on the island of Barbados there is a burial vault of unknown origin. The earliest records call it the "Chase vault". It was first used for the burial of a Mrs. Goddard in1807, followed by two-year-old Mary Ann Chase in 1808 and her sister Dorcas in 1812, a probable suicide. A few weeks later, Dorcas' father Thomas Chase died. When the vault was opened, all the coffins had been moved from their original places. It was thought that thieves had been in the vault, but the concrete seal of the tomb was still in place. Two more burials were made in 1816. In both cases, when the vault was opened, the coffins already present had been moved about. The casket of Thomas Chase was of lead, weighing 240 pounds, far too large to be moved by a single vandal. In each of these burials, the workers returned the coffins to their proper places and sealed the mauso leum with cement. It happened again in 1819. This time, the Governor sprinkled sand on the floor (to sho footprints), and pressed his personal seal into the fresh cement. In 1820 the tomb was opened again, and the coffins were again out of place, even though no footprints showed and the concrete seal was undisturbed. The governor ordered the coffins removed and the vault left open; the mystery has never been solved. La Llorona: La Llorona is the legend of a woman who has lost her children, and who can be heard, and sometimes seen, weeping in the night. La Llorona (the name means "She who weeps" in Spanish) is in most stories said to be Mexican, although sometimes she is a woman who lived in the American Southwest. The woman has lost her children, usually because she herself has killed them because she wants to marry a man who doesn't want any children. She is so anguished over the depressing circumstances that she kills herself as well, and is thus doomed forever to roam her native land, weeping and wringing her hands. Sometimes she is said to be searching for her children, and sometimes she is said to appear only as a warning to those who see her. In the Southwest, she drowned her children in the acequia (irrigation ditch,) and now she roams the ditches looking for her, or any, children. Usually the story is told with the intentions of keeping kiddies away from the ditches, so they won't drown. Around Mexico City in 1550 according to legend, an Indian princess fell in love with a Mexican nobleman. The nobleman promised to marry her, but betrayed her and married someone else instead. The ultimate result of this treachery is that the princess murdered her children in a fit of rage, with a knife given to her by the nobleman. Afterwards, she wandered the streets crying for her children, and was eventually hanged for her sins. Since then her ghost has been searching for her children. The Amityville Horror: The Amityville Horror, although now considered a hoax, is one of the most famous haunted house of all time. The small house in Amityville, New York was made famous in the mid-70s when George and Kathy Lutz told the media of bizarre happenings which were alleged to have taken place at the house during the month they lived there. These happenings included such things as flying pigs with glowing red eyes, walls that oozed blood, an infestation of flies in the attic, and a pit to hell in the basement. Supposedly, whatever had tormented the Lutzes was also the thing that had driven Ronald DeFeo to shoot and kill his entire family in that house in 1974. On November 13, 1974 around 3:00 a.m., the son, Ronald DeFeo shot his mother, father, two brothers, and two sisters with a high-power rifle. Ed and Lorraine Warren are a husband and wife team who investigate paranormal activity. Their most famous case is probably the Amityville horror. Mary Worth/Bloody Mary: The Mary Worth (also known as Bloody Mary, Mary Margaret, etc) story is popular at sleepovers. As the story goes, a beautiful young girl named Mary Worth was in some sort of terrible accident (or occasionally the wounds are inflicted purposely by a jealous party), and her face was hideously deformed. From then on, she is shunned by other people, and she sometimes becomes a witch. Now for the scary part. Supposedly if you say Mary Worth's name three times while looking into the mirror, Mary Worth will appear and scratch your face off or kill you. The Vanishing Hitchhiker: It is a dark and stormy night. A person driving sees a forlorn figure at the side of the road and decides to give him or her a lift. Usually the hitchhiker is a young woman in some sort of trouble... her prom date dumped her, or her car broke down. The driver gets to her house only to discover that his passenger has disappeared without a trace from the back seat of his car. He knocks on the door to the house, maybe to make sure the girl is ok, and the door is answered by the girl's parent. Eventually it comes out that the girl died some years ago, and every year on the anniversary of her death (or her birthday), the girl hitches a ride back home with a stranger. There are variations of this legend. Sometimes the girl appears to make it home safely, but the driver finds something the girl left behind in his car, and goes back to return it, thus learning the truth about the girl. Sometimes the driver lends the girl his jacket or sweater, and goes back the next day to retrieve it. Haunted Train tracks: Once, there was a tragic accident on set of train tracks: A busload of children was crossing the tracks, and could not get out of the way in time to avoid the approaching train. Now, if your car stalls out on the tracks, it will be pushed over the tracks to safety before the train hits you. The ghosts of the children have saved you, and sometimes you can see their small handprints in the dust on your car. The most well-known example of this urban legend are the haunted train tracks in San Antonio, Texas. The Whaley House, San Diego, Calif.: Southern California's oldest two-story brick structure is also possibly "the most haunted house in America." Now a museum, it was completed in 1857 by pioneer Thomas Whaley, who "never left. He's a tough one." Other apparitions include a crying baby and even a "ghost dog." The Constellation, Baltimore, MD: Now a floating museum in the city's Inner Harbor, the 1797 frigate was once a flagship of the U.S. Navy. Among the more storied ghosts are a former captain and a crewman who was put to death ("strapped to a gun and blown to bits") for falling asleep while on watch. "(The captain's) own feelings of guilt about this execution perhaps caused him to remain aboard." The Guthrie Theater, Minneapolis, Minn.: In 1967, a young usher shot himself to death in his car. Since then, his likeness has been spotted near and in the building, including in aisle No. 18, where he worked. "Perhaps it was his home away from home." The Morris-Jumel Mansion, New York City: A former Revolutionary War headquarters, the house was bought in 1810 by French wine merchant Stephen Jumel and his American-born wife. In 1964, a group of visiting schoolchildren said they were "shushed" by a woman in a filmy violet dress - presumably Madame Jumel. "Subsequent curators have been told to downplay the ghosts, out of fear that rowdy elements might want to be difficult on Halloween." The Queen Mary, Long Beach, Calif.: The posh ocean liner brought glamour to the high seas in 1936. In 1967, she steamed into Long Beach, her final docking, where she is now a museum/hotel . Numerous ghostly sightings include one by doorway No. 13, where a young crewman was crushed to death during a 1966 safety drill. His presence is usually preceded by a loud sound described by one night watchman as 'metal rolling quickly toward me.'" Gettysburg National Military Park, Gettysburg, Pa.: One of the bloodiest conflagrations in the bloody Civil War occurred in a part of the battlefield called Little Round Top. "A phantom soldier (wanders) this area - he appears to be looking for his regiment, and he is clearly not cognizant that he has been killed in battle." The Octagon, Washington, D.C.: Ghostly doings have been reported since the mid-1800s in the graceful 1800 mansion that once housed the American Institute of Architects. One story concerns the original owner's daughter, who fell in love with a man her father disapproved of and jumped from the second-floor landing. She died "on the very spot" where a ground-floor carpet "keeps flinging itself back when there is no one about." The Spy House, Middleton, N.J.: This colonial plantation house turned museum is also "full of entities." Among the apparitions are a woman in white who "tucks the covers into a crib or bed, then turns and vanishes" and a tall, bearded man. 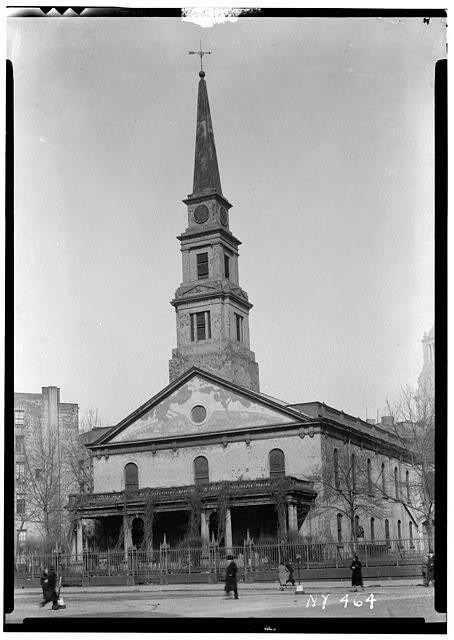 St. Mark's in-the-Bowery New York City: This church was built in 1799 on the site of an earlier one that dates back to Peter Stuyvesant's days as governor. The most notable of three ghosts said to frequent the place is a man with a cane, thought to be "Peter Stuyvesant himself, who had a wooden leg and used a cane." Maco, N.C.: In 1867, a conductor was riding in the rear car when it uncoupled from the train. He waved his lantern to warn a following train, but a crash ensued and the conductor was decapitated. Since then, passersby have reported seeing a moving light at the Maco trestle - it's thought to come from the conductor's railroad lantern. "Unfortunately, he isn't aware of the fact that a train is no longer following him." The Lady in White, Bachelor’s Grove Chicago: This small, abandoned cemetery should have faded into obscurity and probably would have if not for the 100 or so reports of eerie phenomena that have been reported there. Some have called it the most haunted place in America. The apparitions include a mysterious, phantom farmhouse with white porch pillars and a porch swing that squeaks until you approach it. There's also a pond on the grounds that legend says was a dumping ground for murdered gangsters (despite no records of bodies ever being found there). The pond is not only haunted by the restless souls of the unavenged murdered, but also by the ghost of an old farmer, who was pulled into the water by his plow horse. Of course, no haunted cemetery would be complete without its lady in white, and Bachelor's Grove has one, too. She can be seen wandering the grounds, babe in arms, on nights when the moon is full. The Lady Luvibund: On the evening of February 13, 1748, just-married Captain Simon Reed and his bride sailed away from the coast of Kent (in southeastern England) on the Lady Luvibund. The newlyweds went belowdecks to celebrate with friends and crew. Abovedecks, shortly thereafter, first mate John Rivers, maddended with jealousy, bashed the helmsman over the head, took control of the ship, and deliberately drove her onto the Goodwin Sands, a treacherous area of sandbars. By morning there was no trace of the Lady Luvibund. Fifty years later to the day, on the same stretch of coastline, Captain James Westlake saw an old fashioned schooner bearing down on his ship; as it passed by, dangerously close, he heard the sounds of merrymaking. Later that day, a fishing boat saw the same schooner break up on the Sands, but when they went to help, there was no trace of the ship or her crew. Since then, every fifty years on February 13, the Lady Luvibund is said to relive her tragic voyage. The White House: One of the most famous haunted buildings in the US is the White House. Yes, despite all the Secret Serve's efforts to keep out uninvited guests, ghosts routinely visit it's rooms. It probably started with Abraham Lincoln, who was interested in the supernatural, his wife, Mary Todd Lincoln, is said to have arranged for seances to be held in the White House. About ten days before Lincoln died, he had a dream in which he saw himself in a coffin, he told people that he had a dreamed that he had been assassinated. On April 14, 1865, he was shot by John Wilkes Booth. For years afterward, people reported hearing ghostly footsteps around the White House. Grace Coolidge, wife of Calvin Coolidge, the thirtieth president, claimed to have seen the ghostly figure of Lincoln staring out of the Oval Office. When Queen Wilhelmina of the Netherlands stayed at the White House, she reported that upon hearing a knock on her bedroom door, she opened it and encountered the apparition of Lincoln. The room is known as the Lincoln Bedroom. Many others have reported seeing the ghost in or near the room. Perhaps he still thinks of it as his own room, you'd get upset too, if strangers kept sleeping in your bedroom! Pengersick Castle: Pengersick Castle in Cornwall England, is almost a textbook case of a haunted house: it's very old, it has a violent history, and lots of people have passed through it. The original owner of the castle, Henry Pengersick, was said to have been an angry man with a particular dislike for members of the clergy. In fact, he attacked not one, but two of them, beating up local vicar and killing a monk from a nearby abbey. In the years after Henry's death, the castle passed through many hands and strange tales abounded. The groundskeeper at the castle said that he felt something brush by him in the garden, then was overcome by the smell of incense. A neighbor soon reported seeing a ghostly figure of a monk in a long, hooded robe walk right through his garden wall. On another occasion, a visitor to the castle was sitting quietly by the fire when a black dog with red eyes suddenly appeared next to him. The crimson-eyed animal has appeared so frequently that locals have given it a name, "devil's hound." Hogg's Hollow: This incident occured in Toronto, Ontario, Canada, where a subway tunnel runs through Hogg's Hollow, an area that was once a riverbed. Five hundred years ago, before the valley was settled by Europeans, it was the site of a fierce battle between the Iroquois and the Huron. After the battle, a heavy downpour turned the riverbanks into mud, and many of the fallen warriors were washed away before their bodies could receive a proper burial. One autumn night in the early 1990's, three subway maintenance workers were sent to make a repair in a tunnel after the last train had departed. As they approached the worksite, they heard voices. Drawing closer, they realized the voices were chanting, but the words they heard were not English or French. One of the repairmen, a native Canadian, stopped suddenly and exclaimed that he understood some of the words, they were in an old language he had heard his grandfather speak, and they were a prayer for the dead. The workers immediatly called the station to see if anyone else had been given permission to enter the tunnerl, but they were told that no other crews were there. When the workers reached the repair site, the chanting stopped. They fixed the problem and quickly walked away. As they did, they heard the unmistakable sound of beating drums.